Rameka Forest Restoration Project, Golden Bay, New Zealand. Your Resilienz Gift Certificates support this community project to restore a forest, sequester carbon, and help offset the climate effects of our lifestyle and work. To combat global overheating we must rapidly restrict the amount of carbon dioxide (CO2) in the atmosphere. There are two broad ways to do that - minimise CO2 being released into the air, and maximise CO2 being removed from the air. Reducing emissions involves things like driving less - a lot less - minimising food waste, and switching from coal- and gas-fired power stations to solar or wind generation. Removing CO2 mostly involves maxing out forests, and hopefully perfecting major “geo-engineering” systems to absorb CO2. 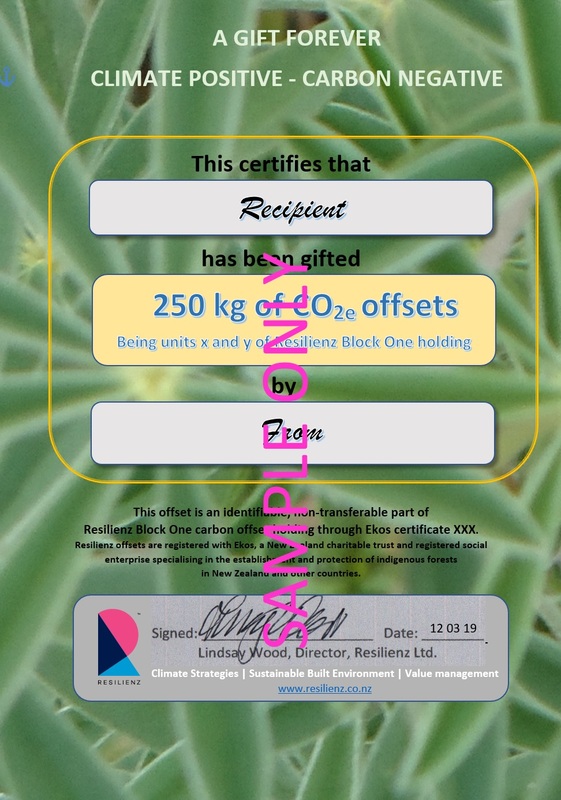 By purchasing Resilienz Gift Certificates you are supporting certified afforestation projects that extract CO2 from the air. Selling Carbon Offset Gift Vouchers was not on our business plan! But in November 2018, with Christmas closing in, we simply wished to encourage people to “think offsets”, and to give small amounts as a great feel-good present and to help others also “think offsets”. We were planning to use our “Climate Matters” newsletter to promote existing schemes to our mainly-New-Zealand-based readership. Except we couldn’t find any schemes! At least not local, least of all in small values ($10 up - under 1 tonne CO2) . It turns out Ekos (well-established in carbon offsetting), were thinking the same, but for procedural reasons. would not be offering less than 1 tonne. 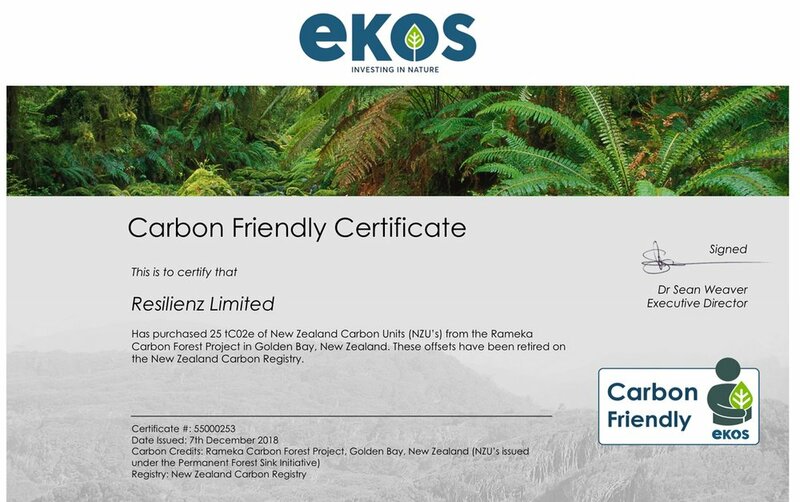 So on almost the same day Resilienz and Ekos offered complementary schemes - Resilienz for under 1 tonne CO2, Ekos from 1 tonne up. Get smaller gifts here, or go to https://ekos.org.nz/gift-packs/ for larger ones. Choose as many gifts as you wish from the table below. Just a single online transaction, even for several gifts. Pay the appropriate amount ($NZ please) to Resilienz Ltd. at account 060197010033801 . In the PARTICULARS box write OFFSETS, and in the REFERENCE box enter your name (as used in step 3). Email to Lindsay@resilienz.co.nz , writing “Offsets” and your name in the subject line. o The kg of CO2e offsets purchased (as per the table above). If more than one gift is purchased, also give the total cost (matching actual payment!). Please state of you also require an invoice. 2.2 Easy red-tape-free purchasing: a simple online bank transaction plus an email to Resilienz. 2.3 Attractive gift certificates for 250 kg, 500 kg, 750 kg and 1000 kg (1 T) of carbon (at the GST-exempt prices of $10, $19, $28 and $35 respectively) with everlasting benefits. 2.4 A unique chance to be part of an innovative, pioneering climate-friendly initiative. 3.1 Individually registered or tradable offsets on the carbon market. Every Resilienz offset is a uniquely identified part of a larger certified offset held by Resilienz in the NZ Carbon Registry. 3.2 The cheapest carbon price. We purchase premium quality offsets and add a small margin to cover part of our costs in subdividing and redistributing these in small lots. 3.3 Larger offsets. Theoretically we can, but we recommend organisations like Ekos and Enviro-Mark for larger offsets, offering more options, economical bulk pricing, and NZ Carbon Unit offsets. 3.4 Carbon footprint calculations. Several good systems are available, (e.g. www.Ekos.org.nz , www.Enviro-Mark.com ). 4.1 Each block of Resilienz offsetting involves the retirement of 25 tCO2e of New Zealand Carbon Units (NZU’s) on the New Zealand Carbon Registry. For example our Block One (Ekos certificate #55000253, as below) is offset against the Rameka Carbon Forest Project, Golden Bay, New Zealand, and issued under the Permanent Forest Sink Initiative. 4.2 Resilienz divides the 25 tCO2e block into 100 numbered lots of 250 kg, each recorded in a register held by Resilienz. Each Gift Certificate in turn identifies the lot(s) allocated to that certificate. 4.3 “CO2e” is an international measure of the equivalence of the warming effect of different greenhouse gases compared with that of CO2 itself. This enables the effects of different gases to be combined in a way that allows them to be offset together by, say, carbon sequestration by trees. 4.4 Resilienz promotes “Climate Positive” certificates in the spirit that any affirmative climate action is a positive step. Ekos, however, use the term “climate positive” for offsets that are at least 20% greater than needed to offset a specific activity. We think the Ekos approach is excellent, and a step towards actually healing the climate and not just avoiding making it worse. However, as Resilienz offsets are only loosely aligned with actual emissions (as against being specifically calculated), they do not suit a “20% greater” computation. In the same spirit as Ekos, we do, however, encourage erring on the generous side, and so helping climate to actually recover.